"A comprehensive and excellent textbook for undergraduate students in tourism. With its more thorough elaboration, new layout and web site references, the professional and pedagogical value of the third edition is considerably increased." "With updated material and sources, enhanced pedagogical learning methods and a new, appealing appearance, this third edition of the Cooper et al. book is a very welcomed improvement on the successful second one; an essential reading for undergraduate and postgraduate students of tourism and for all those seeking a textbook with a thought-provoking treatment of the sector." 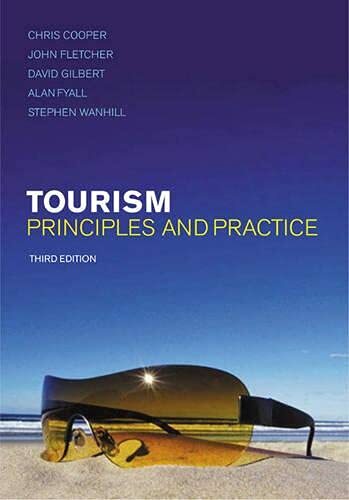 "Tourism: Principles and Practice third edition is an informative and comprehensive introductory tourism text. It balances sound theoretical underpinning in an attractive and bright eye-catching format. There is a mix of self-check questions, essay questions and case studies that build on content and will assist students to understand the subject." "As the business of tourism becomes more and more competitive, so to does the teaching of tourism. Sourcing books that not only teach students the fundamental principles of how the whole tourism system operates and are able to generate deeper thinking of critical issues, but ones that also manage to capture their imaginations is difficult. This third edition of Tourism: Principles and Practice provides a competitive advantage to tourism academics by meeting these requirements. Well researched, a clean layout, interesting case studies from around the world and the good use of colour in this book will ensure its popularity." ‘This new edition makes a timely and valuable contribution to the field of tourism and brings an already excellent book truly up-to-date with the latest requirements in this subject-area"
"An excellently structured and coherent edition of an already crucial text for those studying in the field tourism today"
"Produced by a team of experienced, well respected authors and previously one of the most comprehensive introductions to tourism studies, this new edition is written in an assured style, with a clear readable text, supported by detailed case studies and is presented in an attractive layout. Invaluable reading for undergraduate students!" Security fears, internet bookings, and the budget airline industry - just three of the many factors that have radically altered the shape of both domestic and international tourism in the last three years. Written by an authoritative team of teachers and researchers, the 3rd edition of this leading tourism textbook provides up-to-date explanation and analysis of these key themes, as well as all the other major issues, players and impacts of the world’s largest industry. Supported by a wide range of international case studies – from sustainable tourism in the Arctic to mass tourism in Benidorm – questions and activities to stimulate reflection and discussion, and readings and references to encourage and facilitate further research, Tourism: Principles and Practice provides a comprehensive introduction to the subject. A comprehensive companion website at www.booksites.net/cooper provides valuable extra resources, including self-assessment questions and revision tools for students; case and teaching notes, sample answers and presentation slides for tutors. Chris Cooper is Foundation Professor and Head of the School of Tourism and Leisure Management at The University of Queensland, Australia. Professor John Fletcher, Professor Stephen Wanhill and Alan Fyall are all at the International Centre for Tourism and Hospitality Research at Bournemouth University, UK. "Tourism: Principles and Practice balances sound theoretical underpinning with an attractive and bright eye-catching format. The mix of self-check questions, essay questions and case studies assist students to understand the subject." “A comprehensive and excellent textbook... With its more thorough elaboration, new layout and web site references, the value of the third edition is considerably increased."